HelluvaCook.com! : Grilled Salmon on Good Friday! 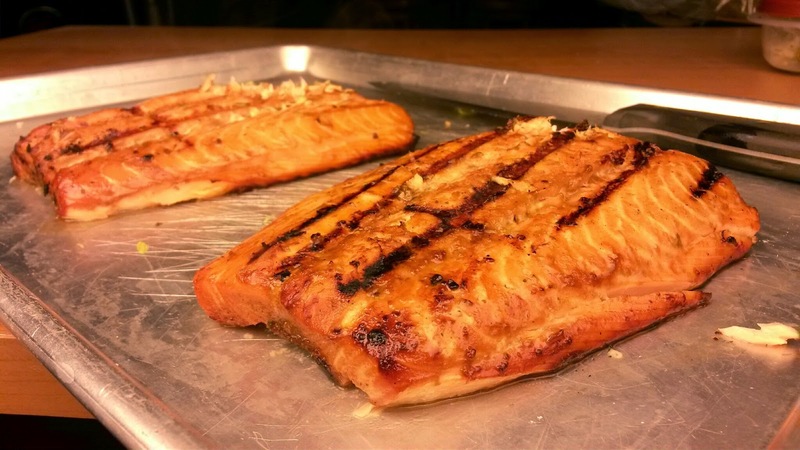 Regardless of whether or not you observe Lent or not, grilled salmon is always tasty, so why not use Good Friday as an excuse to eat some fish! 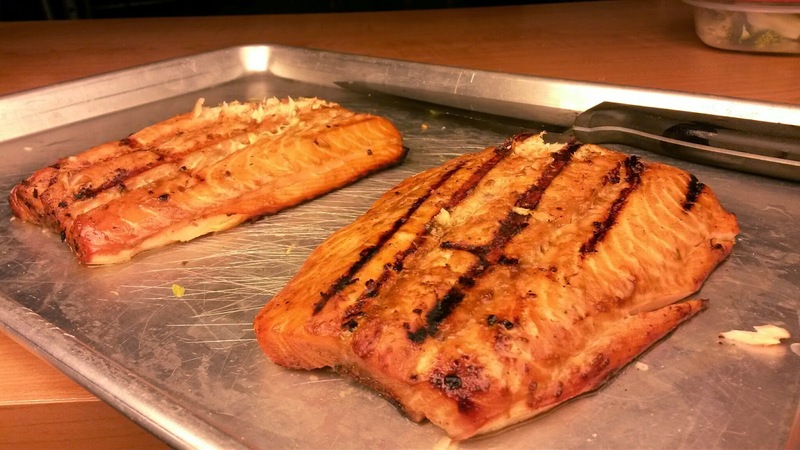 Check out just a few pics of how quick & easy grilled salmon is to make! One of my best buddies still observes the Lenten tradition of not eating meat on Friday's, so I used this as a good excuse to get more fish into my diet! I'd tell him to bring whatever kind of seafood he wanted to eat and I would cook it up and provide a few side dishes! 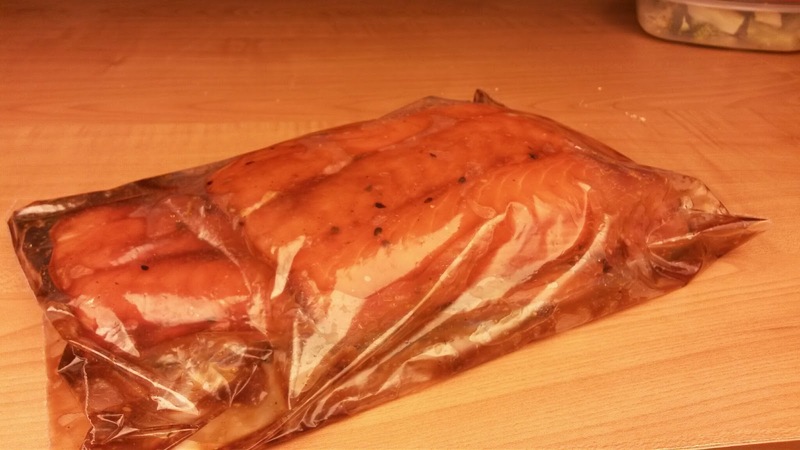 Last week, on Good Friday, he brought over two chunks of salmon that were nearly one pound each! I promptly bagged 'em with some sesame oil, garlic salt, and teriyaki sauce and let the love start happening! 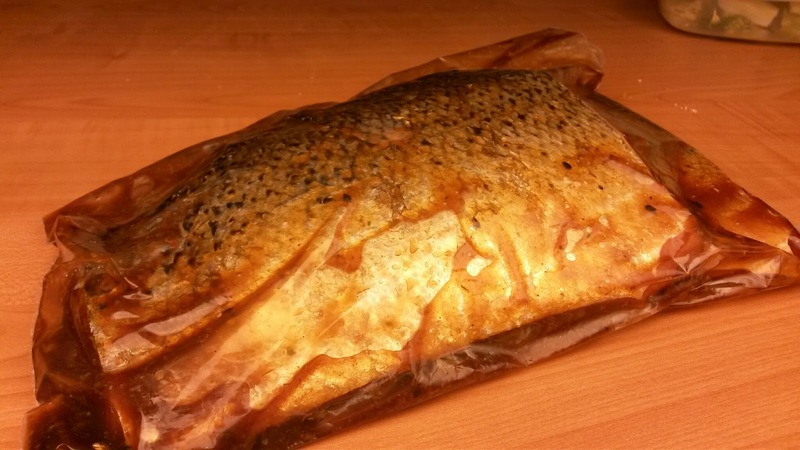 Don't be afraid to get the salmon that has the skin on it! If you grill it up right, the skin keeps the fish from getting dried out & comes right off without a hassle! So, while the love was happening, I whipped up a salad, rice of the a-roni variety, vegetarian baked beans, corn on the cob, and some tortillas to deliver the goods to our faceholes! Start them skin-side down, then flip them when the meat is mostly cooked through! Hit them w/ just a bit of lube before you flip them to make sure that they don't grab on to the grill too well! We didn't get the fish on the grill until midnight because Santana & I were screwing around b.s.ing and having a pop or two! We weren't in any huge hurry... until the fish got done the grill! We then proceeded to scarf down every last bit of it and all the fixin's that went with it! What a hell of a late night supper this was! I can't to grill up some more salmon again soon!